In a strong signal to the US and its allies, China’s Defense Minister on Tuesday said Beijing’s rise “cannot be contained by anyone”, even as Washington pursues its “pivot” towards Asia. “The China-US relationship is neither comparable to US-Russia ties in the Cold War, nor a relationship between container and contained. China’s development can’t be contained by anyone,” said Chang Wanquan. He was speaking to reporters following talks with his American counterpart Chuck Hagel on Tuesday morning. 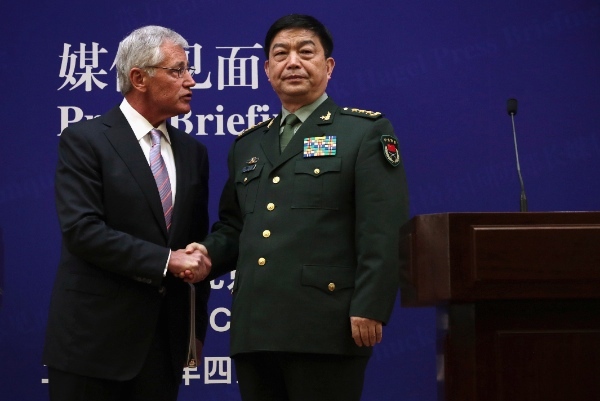 Hagel, on his maiden visit to China as Defense Chief, arrived in Qingdao in east China’s Shandong Province on Monday where he toured China’s Liaoning aircraft carrier. Chang and Hagel vowed to boost ties despite standing on opposing sides of disputes in the Asia Pacific region. Hagel said at the joint press briefing that he had communicated to his Chinese counterpart that Beijing doesn’t have the right to unilaterally establish an air defense zone over disputed islands with no consultation. The US is trying to strengthen its often-controversial military presence in Philippines, one of Southeast Asia’s most strategic countries. “China and the United States have far more areas of common ground than they do differences in the region,” said Chang Wanquan on Tuesday. The Chinese Defense Minister also asked Hagel to reign in its ally Japan and restrain from further escalating tensions in the East China Sea where both countries lay contesting claims. Beijing asked the US “not to be permissive and supportive” to Japan and Philippines during talks between the two defense chiefs of the world’s two biggest economies. “We will neither compromise on, concede or trade on territory and sovereignty, nor tolerate them being infringed on even a little bit,” the Chinese Defense Minister said, toughening its stand on Tuesday. The state-run daily Global Times has also criticized the role played by the US in the region. “Chinese public opinion has given up hope of reason with the US, since Washington is adept in manipulating double standards… Many Chinese believe the core of the US “rebalancing Asia” strategy lies in that the US is attempting to burden China’s rise through instigating confrontation with other countries in the neighborhood,” said an editorial on Monday. Meanwhile, Chang and Hagel also discussed cyber-security during Tuesday’s meet. Look Hagel, we both have nukes and a hot war benefits no one. We see your MO half a mile away so pls don’t try your buffoon policy on us. Anyway, Putin’s got you guys by the in-betweens anyway so tell your puppet president just let it be. Also, your CIA/SIS/MI6 boyz are running wild, you really need to get your black ops boyz in order or the FSB may just clean house for you. hint hint – we know there is a riff between you guys and the black ops thugs. We’ll try to help as much as we can!! !